Lunch at the Whoa Nellie Deli in Lee Vining. If you travels take you across Tioga Pass this fall (which I highly recommend), then make sure and schedule a lunch stop at the Whoa Nellie Deli in Lee Vining. Not only does the cuisine go above and beyond the traditional deli fare, but it’s also got great wheelchair-access. 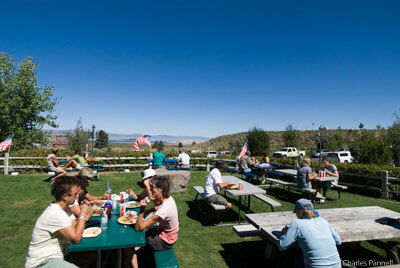 Add in a cool view of Mono Lake, and who could ask for anything more? To be honest, I was a little leery about stopping there after I read some of the comments on Yelp. But then again, most of the negative ones sounded like they were just expecting too much – like five star service and white linen tablecloths – in a rural joint that’s billed as a deli and a gas station. So I figured it was worth shot. And in the end, that was the right call. Access is good at this Mobil Station and eatery, with plenty of accessible parking near the entrance, and barrier-free access to the mini mart and deli. There’s also good pathway access to the outside picnic tables (highly recommended) and the inside table seating. Best of all, they have clean accessible restrooms — a welcome departure from the pit toilets along Tioga Pass Road! Keep in mind that the portions are large, so consider splitting an entree if you’re not a heavy eater. And if you are a heavy eater, then you won’t be disappointed. Besides the regular deli fare of sandwiches, burgers and pizza, the Whoa Nellie Deli also offers some great specialty entrees like fish tacos, lobster taquitos and Cajun chicken jambalaya. I highly recommend ordering one of these specialty items or even the daily special; as the deli items looked so-so, but every hot dish that came off the line looked scrumptious. I went with the chicken jambalaya and Charles had the fish tacos, and neither of us were disappointed. And although it may seem like a madhouse if you go on a busy weekend, the crew does a great job of managing the mob. They’re really quite efficient! All in all, it was a great discovery on the first day of our month long road trip. For those of you following along at home, our route will take us south through the Eastern Sierras, down to Death Valley, then over to Southern Arizona through Tombstone and on to Las Cruces, New Mexico. Then it’s over to Big Bend National Park, Texas Hill Country, San Antonio, Houston, Austin, Fort Worth and Amarillo. Then back home through Taos, Ojo Caliente, Albuquerque, Flagstaff and of course Barstow. Along the way we’ll be visiting some cool accessible inns, trails, sites and restaurants, so look for more stories about them in Emerging Horizons…and in my upcoming book.!! Time to hit the road. Cherrie will be back tomorrow with her take on the trip so far. This entry was posted in Food by Candy B. Harrington. Bookmark the permalink.